Congratulations to the SSKC members that graded tonight, very proud of you all. Many thanks to Mike Gude Senei - 6th Dan from HSKC who was tonight's grading examiner. Jim and Brenda Sensei from HSKC who came down to support the instruction of the club while gradings were going on. I would personally like to thank Matt, Steve, Campbell and Warren Sensei along with Han and Simon Sempai for your ongoing support in preparing students for examination, they could have not done it without you. Well done Loui and Jacob on your first gradings. Finnley is on my list from last week - Well done Finnley and get well soon. Monica, Darcey and Amelia, WOW! I was blown away by your spirit tonight, focused and loud Kia! Ellie and Mark, good gradings .... onwards and upwards, it starts getting difficult now. Caroline, You have worked hard to achieve your temporary grade. anyone who is prepared to put real effort in will get there... Hitotsu! Doryoku no sechin o yashinau koto! - well done! Grace - very pleased with your grading, there is so much "latent" karate talent waiting to burst out, very pleased with your temporary grading. I would also like to make a special mention to Victoria who has helped to prepare you for your grading. A true Sempai, Osu! Well done. Berhan - A solid grading, you showed great spirit. Paul, Matt, Steve and Simon travelled to Nottingham this weekend to train with Kagawa Shihan 8th Dan, World Chief Instructor of Japan Karate Shotorenmei. It was a sell out weekend and if members want to take advantage of these courses please book your places with Paul well in advance. As we know from the dojo Matt makes a great target and he was very honoured to assist Kagawa Sensei in a number of demonstrations. Take a look at the two videos to see some of Kagawa Shihan's awesome kicking abilities, Osu! The Saturday morning session at Selby Leisure centre is a great way to kick start your weekend. Training is from 9 to 10am and is open to 9th kyu and above. 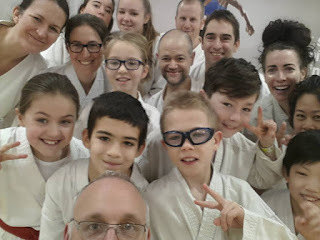 On Monday, Sensei Matt Price - 6th Dan - JKS England coach returned to SSKC to instruct some kumite sessions on the build up to the SSKC / JKS Novice competition at the end of April 17 in York. Over 60 members of the club turned out to benefit from Sensei Matt's dynamic instruction. We are very fortunate to have access to one of England top instructors on a regular basis, Osu!